Amatrol’s Pegasus II Robotic Learning System (880-RA21B) teaches articulated arm servo robotics and how it’s applied in industrial tasks like assembly, material handling, machine tending, gluing, and inspection. This learning system includes 5-axis articulated servo robot arm with a 360 degree work envelope, industrial controller, and state-of-the-art teach pendant which are used to practice over 140 executable commands using the powerful MCL II language. 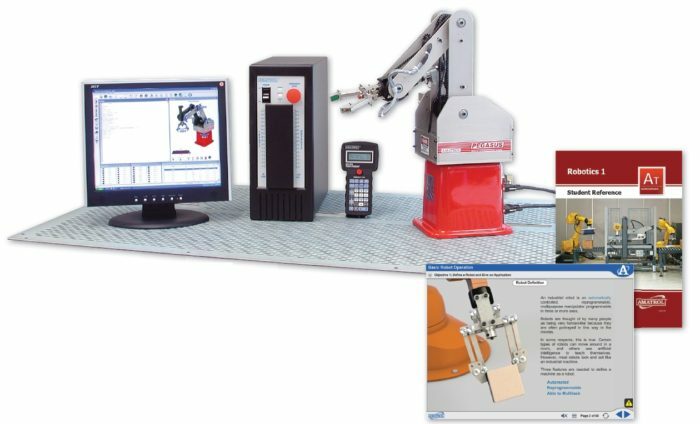 The 880-RA21B also includes world-class curriculum which covers major topic areas like basic robot operation and programming to accomplish hands-on skills such as jogging a servo robot using the teach pendant, entering and editing a basic robot program, and designing a robot program to perform a basic material handling task. The combination of theoretical knowledge and hands-on practice allows learners to gain both conceptual and practical knowledge, which broadens their competency in robotic applications. This is just one reason why Amatrol is the world-leader in skills-based, interactive technical learning. The 880-RA21B features a powerful, 5-axis Pegasus II articulated servo robot arm with a gripper. This robot features a double-jointed arm that enables it to work on both sides of its work cell and has a 360 degree work envelope, which increases work cell efficiency. The robot also has industrial quality repeatability (0.18mm) due to worm screw drives, high-resolution encoders, infrared homing sensors, and multiple microprocessors. This repeatability supports training of more precise industrial tasks such as assembly. The 880-RA21B’s teach pendant is a state-of-the-art device that features two-line display, emergency stop button, jog capability, and four soft keys which allows the robot to take on a variety of functions according to the menu shown on the teach pendant display. This unit becomes a handheld programming terminal, enabling users to enter and edit teach points. Complete technical specifications available upon request. This learning system’s curriculum covers a vast range of topics related to robot control including basic robot operation, power up and shutdown, manual operation, homing, end effector operation, basic robot programming, teaching points, movement commands, and end effector commands. Studying these topics will allow learners to practice skills such as test teach points, manually operate a robot gripper, run a servo robot program, and many more. This world-class curriculum is presented in an interactive multimedia format features audio, video, and 3D animations. A sample copy of the Robotics 1 Student Reference Guide is also included with the system for your evaluation. Sourced from the system’s multimedia curriculum, the Student Reference Guide takes the entire series’ technical content contained in the learning objectives and combines them into one perfect-bound book. Student Reference Guides supplement this course by providing a condensed, inexpensive reference tool that learners will find invaluable once they finish their training making it the perfect course takeaway.